You crack me up, Grace. LOL And the salsa sounds great! A divine salsa! I love mangoes. hehe...I had to LOL a few times when I was reading this....Love salsa.. This sounds fantastic! (I tried to think of a witty comment, but I'm only on my first cup of coffee - witty requires a second cup). Hehe, love it! Everything is better with a "wo". Women rock and so does this womango salad!! Lol, love this post, Grace! And this salsa...I bet it's great on so many things! (Wo)Mango just so happens to be my favorite fruit! And so this salsa is likely going to be my new favorite condiment. Love what you've done with it. This looks so fresh, flavorful, and light. I can't wait to make some womangos! 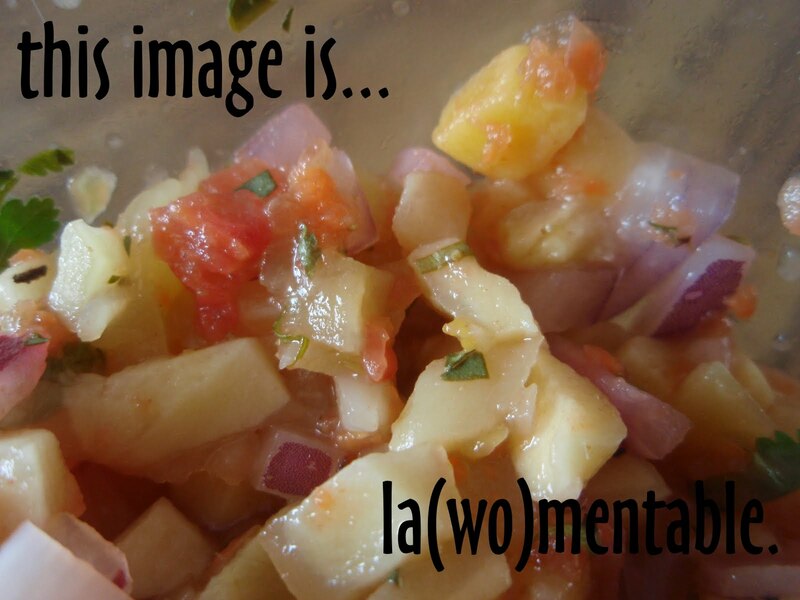 I love fresh mangoes so much they seldom last long enough to get into a salsa! But with black bean quesadillas it sounds delicious. Start writing your womanuscript since you will be famous for this recipe Grace. Mango salsa is a great treat! I love mango salsa and all your woman words were hilarious! Why did I keep hearing Helen Reddy singing "I am Woman" in my head while reading this? There is a fresh-mex place that makes an awesome mango salsa-which is great for me as I do not like regular salsa. Can't do chunks of tomato. I know, I know..
You are hilarious. And this salsa looks tremendous. I love me a good mango salsa. Miss Grace you are a big kick in the head...always keeping me in stitches. My husband is drooling over the salsa. You won't like hearing this, but I love mango salsa with fish! It sounds fantastic with black beans too. Love the kick of jalapenos in it! I love mango salsa and yours sounds extra good Grace....sounds awesome with black beans; I've eaten it with chips too-yum! say something…. your photography is excellent. I love any and all salsa. Hah! You are a hoot, Grace! I can always count on you to make me laugh! Great looking salsa, too. I could eat womany bowls of this! I love mango and mango salsa, so good with lots of things! I love every ingredient in this tasty salsa and I just happen to have a ripe mango in my kitchen right now. MMmmm. I love mangoes plain, in salsa, any which way. They are one of the best fruits on the planet!! Glad you discovered them. You always bring a smile to my face. I'm so glad you enjoyed the womango! My kids adore fresh mangos. And I'm pretty positive I'd adore this salsa. Yum! I wish I had your sense of...humor?...politally correctness?... I love mango salsa. Glad you discovered it! lol, clever as usual! I love womangos too! Grace, going through the ingredients list made my mouth water...love the mango in it...so refreshing. I'm a recent convert to mangoes. Now my family will go through a whole Cosco box of them. The salsa looks fab! Adorable play on words. Thanks for stopping by my blog. It was fun hearing about how you had come close to plowing over a cow. It reminds me how when we dove down in the lower forty-eight with my kids for the first time my son went crazy every time we saw a cow. No biggie if it was a moose...but a cow--WOW! we love manogs, I mean womangos, lol a perfect salsa!! LOL you crack me up my dear. This looks delicious! Love the sweet and pungent here! I could eat gallons of this so easily. Too funny. Nothing like a sweet ripe mango. I love mango. Love it in any way shape or form! Would totally love to dig into this with a chip! I'm not much of a mango buff but you have coerced me to try again. This looks glorious! Perfect for summertime! Hello, my name is Irina, I'm Russian but I live in Italy for many years, I'm always looking for new friends and new recipes from around the world. A pleasure to meet you and your blog. I sign up as your following, and if you want to reciprocate and follow of my blog, I'd be happy! A hug, and the recipes look. . .
About time you had a fresh mango! And who could resist the title of this post, haha! I had no idea what to expect upon opening it. Love the salsa-how perfect for enjoying with crispy chips and a cool drink when the weather gets warmer. Bet this would be great in a fish taco! Yum!